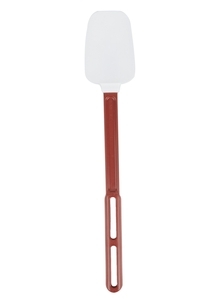 The Vollrath 58126 16 3/8" high-temperature SoftSpoon™ spoonula offers the perfect tool all of your food prep and baking needs. Designed to resist high temperatures, this spoonula is heat resistant up to 500 degrees Fahrenheit to maintain its structure when used with piping-hot pots and pans. 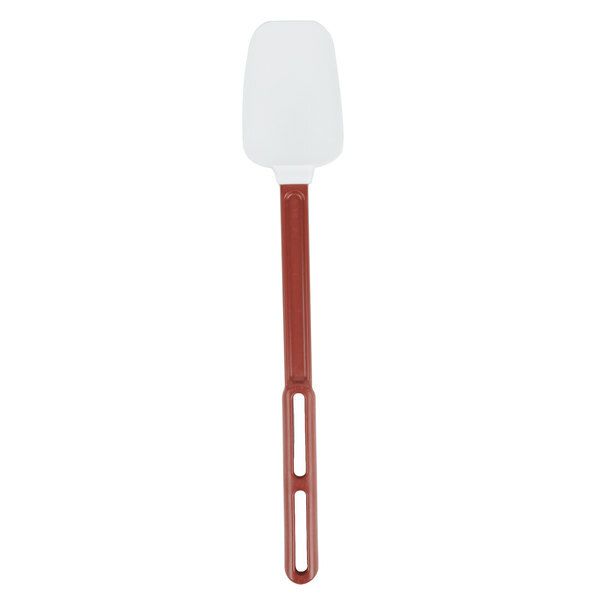 Combining a silicone blade with a durable, nylon handle, this spoonula is created for daily, heavy-duty use. "Perfect to use with a 20 quart mixer, handle is long enough to keep my hand out the batter and strong enough to handle my thick cake batter. Will be purchasing more for the kitchen." 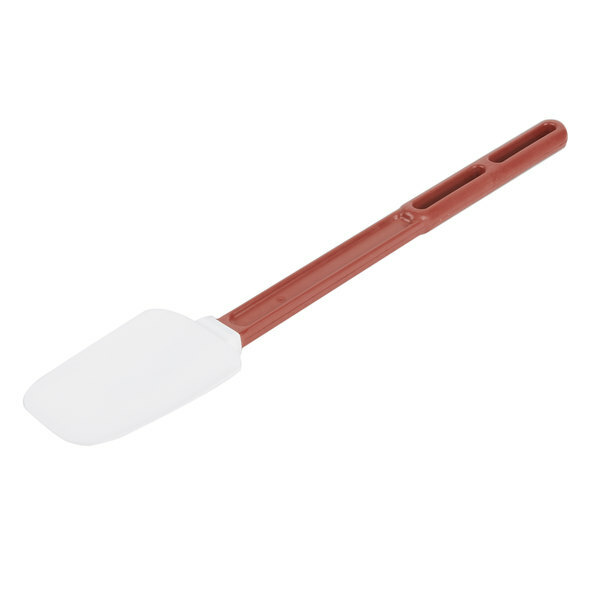 Featuring a non-scratching, stain and odor resistant silicone blade that is spoon-shaped and easily flexes, this utensil makes it easy to simply scoop out food or scrape the sides of with any shape container without scratching it. 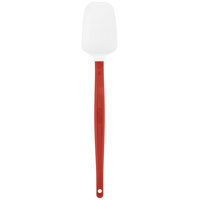 Plus, because it's non-scratching, this spoonula is ideal for use with non-stick cookware. 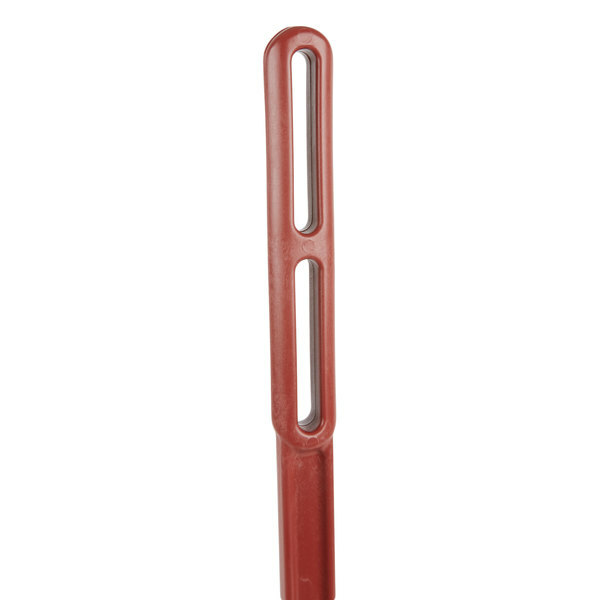 A durable, contoured nylon handle offers a comfortable grip and hangs conveniently for storage. The spoonula's silicon rubber nubs keep the blade from touching the counter surface for sanitary use. The blade and handle are molded together to form a sanitary seal, thus eliminating areas where food can get trapped. 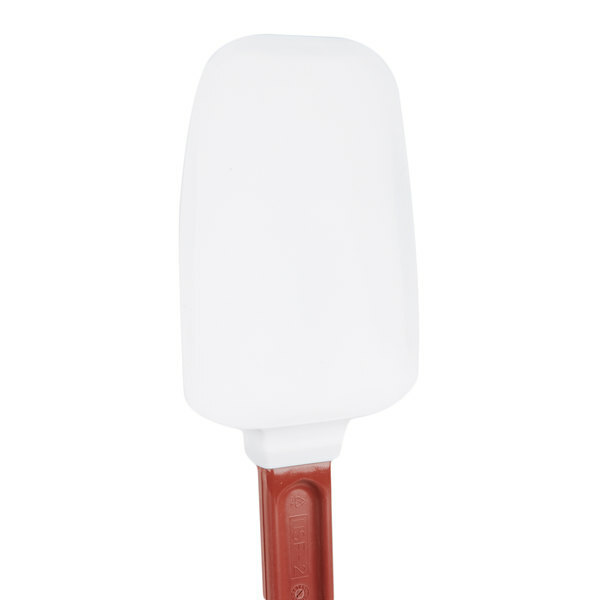 By making this spoonula easier to clean, the molded design reduces the chances of cross contamination and helps ensure sanitary conditions. I was making a big batch of rice pudding in a pot that covered 4 burners, I was using a 12 inch spatula with the thinner handle, it was too short and too weak, and I kept burning my hand on the steam. I needed a better tool. I went with the spoonula instead of the spatula cause I thought it would be better for stirring. $11 seemed a bit much for a spatula but this is the one I needed. But this thing is great quality it is sturdy and long, saving my hand from steam, most of the time, I love it, it's probably become one of the must have tools in my kit. Perfect to use with a 20 quart mixer, handle is long enough to keep my hand out the batter and strong enough to handle my thick cake batter. Will be purchasing more for the kitchen. This is a must have for any baker! It's quality is remarkable. It has a very long handle, perfect for frosting large cakes. It is very easy to clean. These spoonulas have been a life saver! We used to spend more money on non high temperature spoonulas from our supplier and they did not last and stained very easily, and the supplier's high temp ones were four times the price of these. Once we got a few of these employees would basically fight over who got them. They are now the only spoonulas that we use in house. They last a long time, they do not stain and they clean very easily. We use this for both hot and cold items for the spoonula has a nice softer tip that is great for sauces and toppings. I love my Spoonula. I have a very large pot and have trouble finding utensils long enough to use with out burning myself, but the length of this is perfect for for having to continually stir liquids. A nice addition to our kitchen. The long handle is great for keeping your hands out of deep mixing bowls and the scoop shape of the head is great for getting product from point A to point B.
I needed a spoonula that was durable enough for all my needs and one that washed up well with out discoloration. Bought others that did not hold up at all.